Today, we are gathered here on this solemn occasion to mark the first anniversary of the devastating Wenchuan earthquake. At this moment, our thoughts are with those compatriots who fell victim to the earthquake and those heroes who gave their lives for the remarkable success of the rescue and relief operation. At 14:28 on 12 May 2008, a massive earthquake struck Wenchuan of Sichuan Province. It was an earthquake that shocked the world. It caused heavy casualties and property damage, and inflicted enormous losses on local economic and social development. 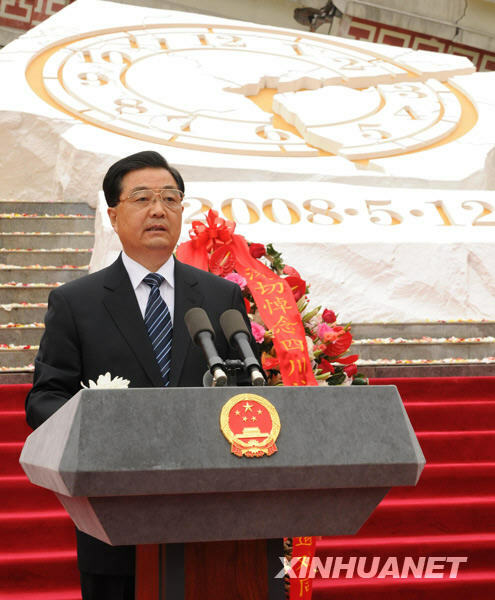 In the face of the unprecedented natural disaster, the whole Party, armed forces and people of all ethnic groups in China rallied behind the strong leadership of the CPC Central Committee, the State Council and the Central Military Commission, and worked as one to fight the disaster with great determination, courage and strength. We launched a rescue and relief operation which was faster in response and mobilized more personnel and resources than ever before in China's history. We made the utmost effort to save lives and minimize the damage, and achieved major success in the fight against the disaster, demonstrating the indomitable and unyielding spirit of the Chinese people and writing a touching and heroic chapter in the history of our nation. In the aftermath of the earthquake, we made scientific plans for rehabilitation and reconstruction, promptly introduced a host of policies and measures to support the quake-hit areas, energetically organized one-to-one assistance programs, and swiftly launched rehabilitation and reconstruction work in accordance with the principles of putting people first, respecting nature, making coordinated plans and carrying out reconstruction in a scientific way. Thanks to the strong support of the CPC Central Committee, the strenuous efforts of the local officials and people and generous assistance from the rest of the country, notable progress has been made in the reconstruction of urban and rural homes, schools, hospitals and other public service facilities, the rehabilitation and reconstruction of infrastructure, the rebuilding and restructuring of industries, the preservation of places of historical and cultural interest, as well as in ecological rehabilitation. With these major preliminary successes, the people in the quake-hit areas are now marching toward a new life. All this has laid a solid foundation for the complete success of our relief and reconstruction endeavor. The concerted efforts of the entire Chinese people in the relief and reconstruction operation – from leaders to the ordinary people, from compatriots within China to those from abroad – are the best expression of our national character of solidarity and hard work and fully demonstrate the enormous strength we can have if we all stand together in times of adversity. The success we have achieved will further inspire the Chinese people of all ethnic groups to carry forward the cause of reform, opening-up and socialist modernization with full confidence. On behalf of the CPC Central Committee, the State Council and the Central Military Commission, I hereby pay high tribute to all the officials and people, officers and men of the People's Liberation Army and the People's Armed Police, the militia and the reserve force, and the public security officers and policemen who have fought heroically in the forefront of disaster relief and reconstruction; to all the officials and people, personnel of various democratic parties, the Federation of Industry and Commerce and people without party affiliation, people's organizations and various sectors of the society who have given strong support to the relief and reconstruction efforts; and to our compatriots in Hong Kong, Macao and Taiwan, and overseas Chinese communities who have offered assistance to the quake-hit areas. In fighting the disaster and rebuilding the quake-hit areas, we have received deep sympathy and valuable support from leaders, governments, political parties and social organizations of many foreign countries and their embassies in China, from relevant United Nations agencies and international organizations, and from foreign enterprises and friends. On behalf of the Chinese Government and people, I wish to once again express our sincere thanks to them all. China is now at a crucial juncture in its effort to tackle the impact of the international financial crisis and maintain steady and relatively fast economic growth. On the way forward, we will continue to follow the guidance of Deng Xiaoping Theory and the important thought of Three Represents, fully apply the Scientific Outlook on Development, and vigorously advocate the great spirit displayed in the earthquake rescue and relief effort. We will promote all-round progress in socialist economic, political, cultural and social development, in fostering a conservation culture and in Party building, strive for the complete success of the disaster relief endeavor, and work in unity towards the grand goals outlined at the 17th National Congress of the Communist Party of China. We will continue to make earnest effort to promote sound and fast economic and social development. Since reform and opening-up, China's comprehensive national strength has improved consistently. This has served as a solid material foundation for us to prevail over the devastating Wenchuan earthquake and to overcome other difficulties and challenges. We will be committed to the strategic thought that development is of overriding importance and always keep steady and relatively fast economic growth on the top of our economic agenda. We will carry out the package plan to further boost domestic demand and achieve steady and relatively fast economic growth in real earnest and do all we can to ensure economic growth, improve people's livelihood and maintain social stability so as to score new progress in economic and social development. We will continue to make earnest effort to push forward post-disaster rehabilitation and reconstruction. To ensure smooth progress in post-disaster rehabilitation and reconstruction concerns the fundamental interests of the affected people as well as the long-term development of the quake-stricken areas. We are faced with arduous tasks in this regard. We will comprehensively implement the policies, guidelines and programs of the CPC Central Committee regarding post-disaster rehabilitation and reconstruction. We will step up effort and speed up the pace to overcome difficulties with a view to basically achieving within two years the targets originally set for three years. We will continue to put people first and focus on solving issues related to people's well-being. We will give priority to restoring people's basic living conditions and public service facilities and ensure that the affected people will move into permanent houses at an early date. We will restore and upgrade the level of public services in education, medical care, culture, sports and other fields, improve the quality of infrastructure facilities and promote the development of industries with distinctive local features and advantages so as to build a beautiful new homeland where the people live and work in contentment, urban and rural areas enjoy common prosperity and man and nature coexist in harmony. While continuing to provide one-to-one assistance, we will also advocate the spirit of self-reliance and making pioneering effort and encourage the officials and people in the quake-hit areas to build a better future with their own hands. We will intensify the oversight of the use of materials and funds for disaster relief and post-quake reconstruction and ensure the quality of construction projects. We will continue to make earnest effort to strengthen disaster prevention and mitigation. To enhance disaster prevention and mitigation capacity is essential for protecting people's lives and property. It is also a major task facing the whole mankind. We should create favorable conditions to fend off natural disasters, give equal importance to disaster prevention and mitigation, address both symptoms and root causes and coordinate governmental and non-governmental efforts in order to improve our comprehensive capacity in preventing and withstanding natural disasters. We should intensify international exchanges and cooperation in disaster prevention and mitigation and in international humanitarian assistance so as to make positive contributions to mankind's endeavor to prevent and withstand natural disasters. Our achievements in this great earthquake relief and reconstruction endeavor have once again demonstrated that unity is strength and hard work leads to victory. The whole Party, the armed forces and people of all ethnic groups in China should unite together even more closely, courageously overcome all difficulties and dangers on the way forward, strive for the success of our work on all fronts and greet the 60th anniversary of the founding of the People's Republic of China with outstanding achievements.